When my nice Logitech MX510 mouse died, I couldn’t find an equivalent replacement at Logitech and eventually went for a Corsair Sabre RGB. It’s not quite the same, but overall it contains as many usable buttons (the one right under the wheel is just unusable to me) and looks like the wheel won’t catch dirt as easily. It also has lots of lights, which is quite a change coming from a mouse with no LEDs at all (although I’d rather not have those and have a lighter invoice…). The settings (speed, light, button mapping) are quite complete, however they only kick in when the control software (“Corsair Utility Engine”) starts, which I find a bit annoying. But this was also the case, to some extent with my previous mice. 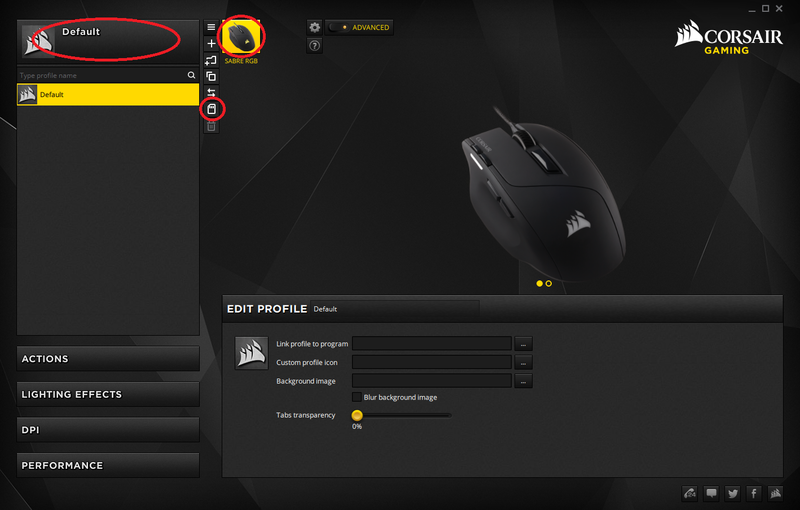 Those are the 3 key points: make sure the mouse is selected (right-most highlighted button yellow), and that the profiles list is selected too (toggled by clicking the left-most highlighted button). Then the 3rd, tiny button should appear and allow you to save your profile into the mouse.